The incident on Monday led to a dispersal of a rally calling for the release of several activists detained last weekend. Interior Ministry officials say the protesters were trying to block the entrance to the police department where the detainees are allegedly being kept. After the police tried to disperse the crowd, a brawl started. Several people were arrested in the incident. 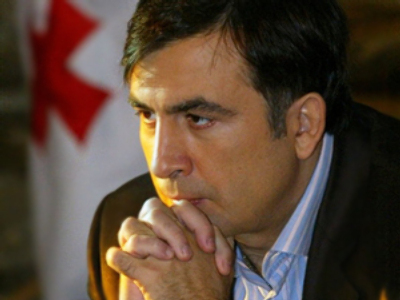 At least one opposition leader was seriously injured and is now in hospital, told the journalists Nino Burdzhanadze. She claims the government has launched a repression campaign and called her supporters to gather in front of the parliament building. “Today’s rally was absolutely peaceful. 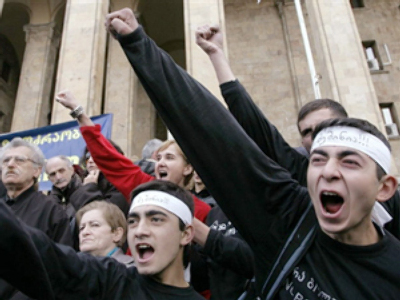 Why did [the authorities] decide to begin real tension?” Burdzhanadze wondered. However she didn’t give her account on the event, saying she lacked accurate information. On the other hand the opposition claims it’s the third crackdown on their rallies in different parts of the city on Monday. Earlier a dozen people armed with batons destroyed about 30 makeshift cages, which the opposition is using as a symbol of what they call Georgia’s sliding into a police state. They didn’t specify what made them link the attackers with the authorities. In addition, two opposition TV channels stopped broadcasting in a protest against the clash at the police station. 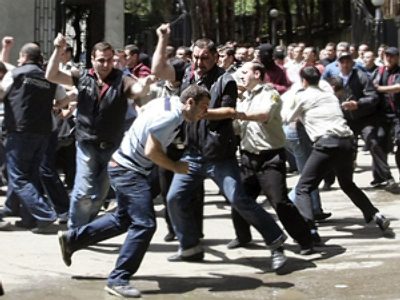 A journalist from Caucassia channel witnessing the rally and the cameraman on his team were allegedly beaten and the video footage they shot was confiscated. 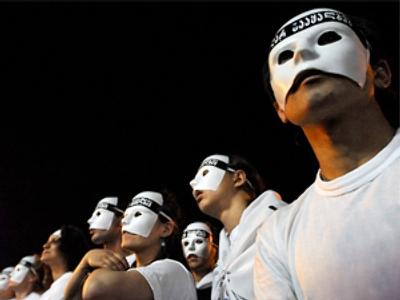 In response, the opposition leaders have decided to start a 24-hour demonstration in front of the government building. “We’ll be here throughout the night in order to not let [speaker of the parliament] David Bakradze, [Member of Parliament] Giya Tortladze and [Interior Minister] Vano Merabishvili get revenge,” said opposition member Eka Beselia. The Georgian opposition has been rallying since April in a bid to make President Saakashvili resign, accusing him of authoritarian moves and lack of political judgment. So far they have made little progress in reaching their goal.